What do a Doctor of Linguistics, a married couple visiting San Francisco from Rome, and an entrepreneur have in common? They were some of the people who took part in my usability study for Square Order outside of Workshop Cafe on Montgomery. 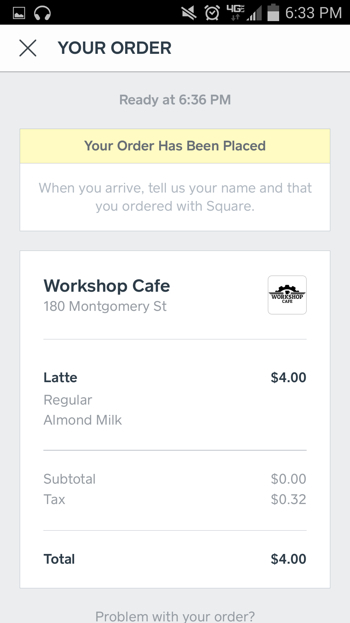 I thought Square Order would be a great app to focus a usability study on because it is beautifully simplistic and I enjoy using it. Therefore, I was interested in the insights new users would bring to my attention with their fresh take on the product. After connecting your debit account to the Square Order app, you can order from any of the participating vendors. When you open the app, it brings you to a list of businesses that utilize Square Order. This list shows you the closest restaurants and cafes based on your current geo-location. From there, you choose the cafe you would like to order from, select an item off of the menu, and checkout. Seems simple, but there are many surprising nuances. Observe new Square Order users order a coffee for the first time. View the process of finding the map after ordering the coffee. Record the screens to capture all user interactions. A type of usability study that is qualitative rather than quantitative, but can provide extremely valuable information for early iterations without a large upfront commitment necessary is a Guerrilla Usability Test. The quick way to explain my approach is that I make eye contact with people while holding a sign that says I will buy them coffee. I then sport a goofy grin and when they smile back, I ask if I can buy them a cup of coffee in return for five minutes of their time. In this case, I was in the position to buy them a coffee that I knew they wanted. After all, they were already walking into the cafe. I held the sign, and connected with 8 participants. As I expected, they provided me with great insights. The added benefit was that I had an interesting conversation with most of them when the exercise was complete. What I find interesting about this type of study is that it isn’t limited by the restrictions of being quantitative. Sure, there were a couple of issues that bubbled to the surface, but there was something that only one person mentioned that I think could be addressed. One out of eight certainly isn’t a majority, but statistical significance takes a back seat here! There were a few specific issues uncovered with the map function within the app, but what stood out is likely the most simple to address. 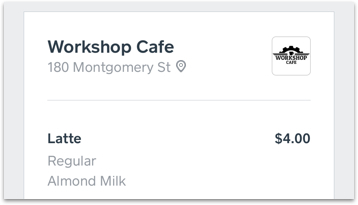 After completing the purchase process, people were prompted to find the location of the cafe on a map within the app. Multiple participants would attempt to click the address listed on the receipt. It is reasonable to assume that this navigation would be present as it is shown in a visually similar manner to the address on each location’s own page within the app. Solution: Make the address on the receipt a tap target that directs to the map page for the location. When making a selection for a menu option, such as regular or decaf for a coffee, users had the expectation that making the selection would then return them to the prior screen. There was typically hesitation or random tap selections being made when nothing happened after the option was selected. Solution: When an option is selected, that tap should also redirect to the prior screen. This was the issue that was only discussed by one person, but that doesn’t matter as far as I’m concerned because I think it’s a great idea. He shared that he is a heavy user of a competitive app called “OrderAhead.” Something he noticed was that neither app utilizes a favorites list, which is something he would view as a differentiator. Solution: Don’t make users scroll through looking for the place they want. In addition to the “Nearby” menu, allow for a “Favorites” list influenced by frequent purchases on the app. Only one participant was unable to locate the map within the app when prompted. Everyone else had a relatively easy time completing the task, but there were many cases where the users were surprised by the amount of information provided on the page. Solution: Utilize a location pin next to the address to encourage people to click for location. Additionally, include an information icon so that users realize that there is more than just a map when the address is clicked. I do not work for or represent Square. I am currently working on UX projects at Tradecraft under Kate Rutter. Square Order is a product I enjoy and use often.